The natural harbor found about halfway between the Temperance River and the Canadian border once contained a large marsh, causing French trappers to name the spot Grand Marais, “great marsh.” (The Ojibwe named the area Kitchi-Bitobig or “double body of water” for the two separate areas formed by the town’s twin bays.) The American Fur Company operated a fishing station at Grand Marais as early as 1823, but it was gone by 1840 and no settlement communities were established until the 1854 Treaty of La Pointe opened the North Shore to European settlement. Robert McLean brought a party to the site that same year to prospect for rumored veins of copper, gold, silver, and iron ore, but little materialized. In 1856 John Godfrey (some accounts record his first name as Richard) set up a trading post and has since been considered the town’s first permanent resident. But Godfrey became discouraged and returned to his native Detroit just a few years later. The town didn’t see significant growth until the fishing industry picked up and regional logging started in 1871 to feed the growth of Duluth. During the 1870s Henry Mayhew, Samuel Howenstein, and Ted Wakelin settled on the bay, purchased most of the surrounding land, and developed warehouses, docks, and a railroad right-of-way. No roads reached the outpost, so all goods had to arrive by boat. Henry and Thomas Mayhew opened a store that also served as a trading post. 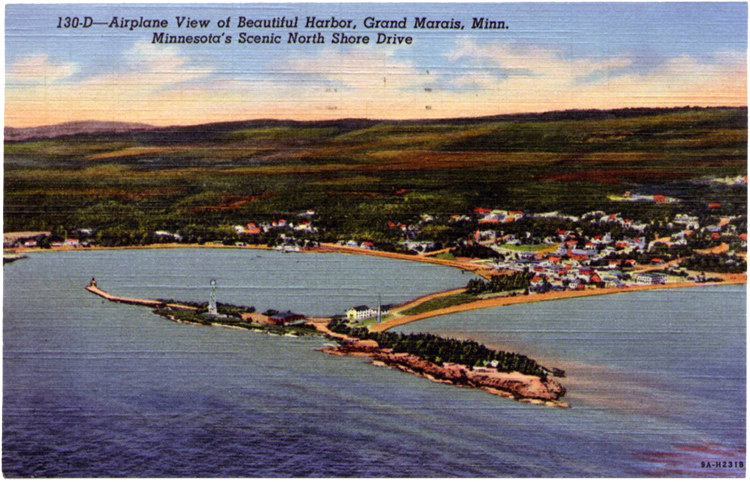 Tourists began arriving as early as 1890, and today Grand Marais remains the North Shore’s biggest visitor destination. At settler John Godfrey’s behest, Congress appropriated $6,000 to build a lighthouse at Grand Marais in 1856—but it never materialized. Thirty years later, as Grand Marais had become a center for logging and fishing, the natural harbor town saw more and more shipping traffic, raising safety concerns. In 1885 Congress made $9,552 available for a lighthouse, and the next year a thirty-two-foot pyramid-shaped tower sporting a fifth-order Fresnel lens stood watch over the harbor. It included a 1,500 pound fog bell taken from the Passage Island Lighthouse off Isle Royale in 1884. Joseph Mayhew became the lighthouse’s first keeper.